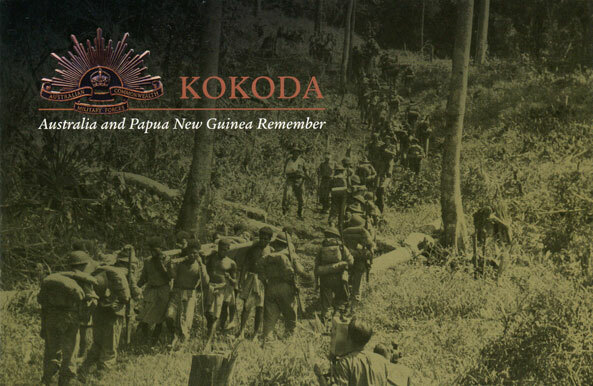 Kokoda in Papua New Guinea holds a special place in Australia's military history. The Kokoda Track Campaign was fought here between July and November 1942 between Japanese and Allied - primarily Australian - forces in the then Australian territory of Papua. 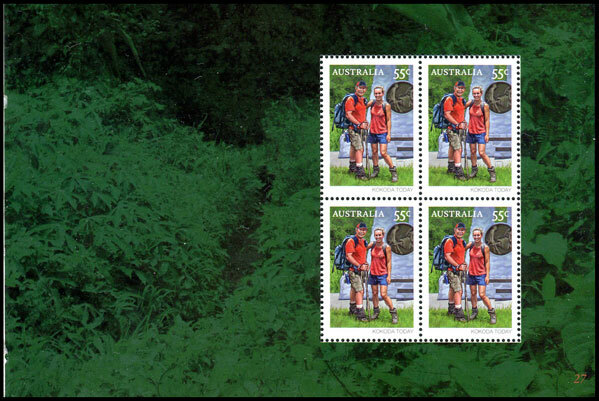 Australia Post's issuing policy normally restricts stamp issues to celebrating anniversaries in multiples of 50 (i.e. 50th, 100th etc. ), however for joint issues special consideration is applied. Those interested in the design of these stamps should visited Brian Clinton's website at http://www.brianclintonauthentics.com/. 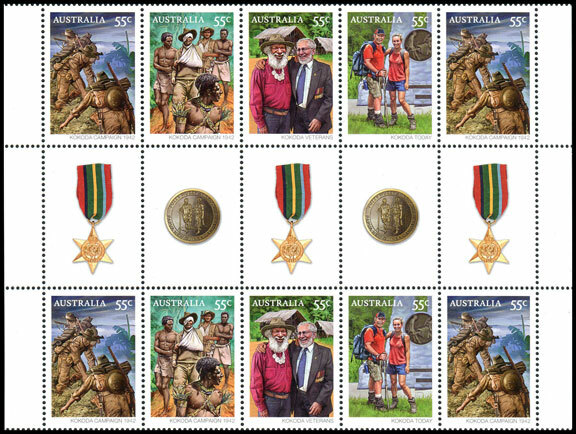 This issue commemorates both the Kokoda Campaign of 1942, the veterans, and present day Kokoda. 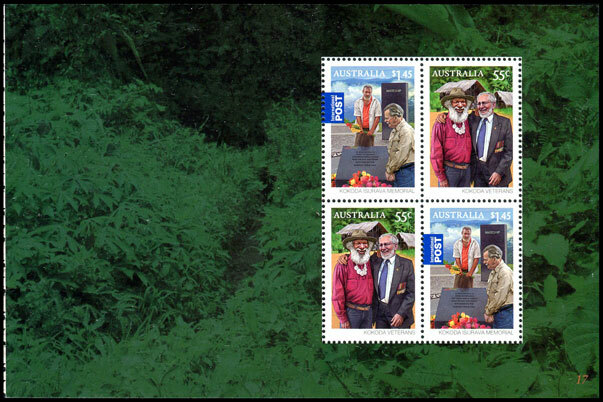 $1.45 is the rate for mail to Papua New Guinea. 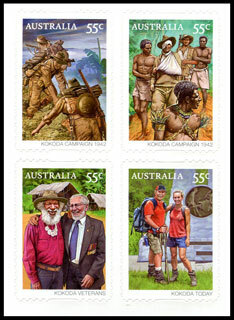 The Australian stamps are printed in a se-tenant strip of four (55c x 4), with the $1.45 printed in separate sheets of 50. 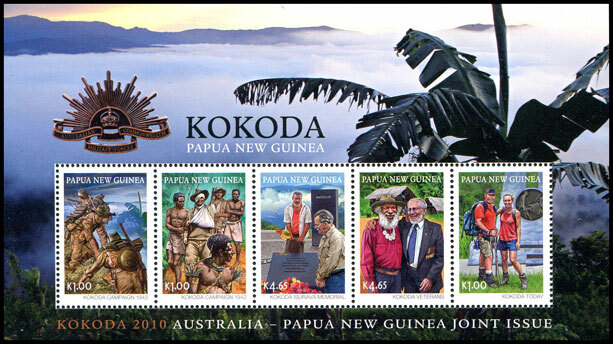 Interestingly, the Papua New Guinea stamps were printed in a se-tenant strip of three (K1.00 x 3) and a pair (K4.65 x 2). The gutter shows the Pacific medal and a medallion. This issue actually has a gutter strip of eight, but will be collected (and sold) as a gutter strip of 10. 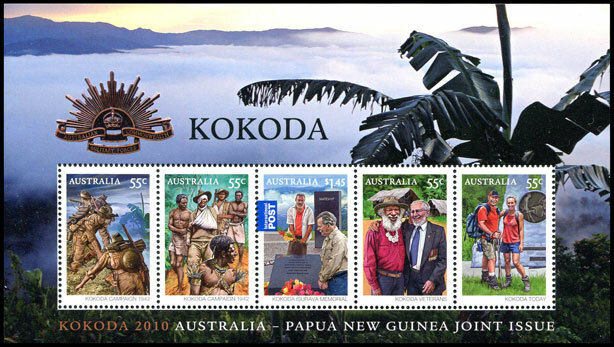 The same shade difference also exists between the K4.65 Memorial sheet and miniature sheet stamps from Papua New Guinea, suggesting that this difference is constant. The miniature sheet contains a unique strip of five stamps, with the $1.45 between two pairs of 55c stamps. Unlike the arrangement of sheet stamps, the miniature sheets of both countries show the stamps in the same order, and are the same size. 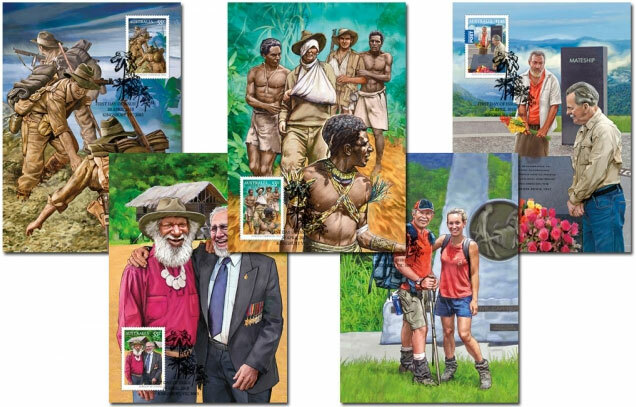 Collectors of first day covers might notice that the miniature sheets used on first day covers measure 160 mm x 85 mm. Australia Post advises me that the top 5 mm of the miniature sheets was trimmed off to enable machine affixing onto first day covers. This site will not list this as a variation, as examples can be easily manufactured by trimming off the top 5 mm. 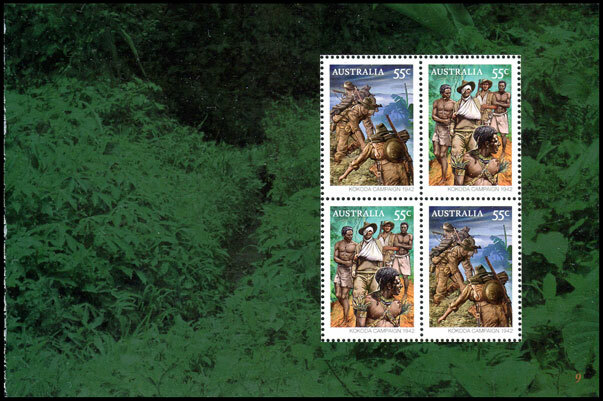 A prestige booklet (sold at $10.95) with more information on the Kokoda Campaign contained various three blocks of four. The above three panes were issued in a prestige boooklet. The four 55c stamps will be issued in self-adhesive coils of 100 stamps. Incredibly this is the first issue coil issue for 2010. The four 55c stamps were also issued in booklets of 10 stamps. Unlike past issues released in both coils and booklets, both versions are identical (including under UV light). Collectors will also note the layout of the self-adhesive booklet allows sets of four to be easily removed from the booklet. The Stamp Bulletin states the paper used for the booklets was B90. I believe this is an error. B90 is regularly used for coil stamps, and B100 for booklets. 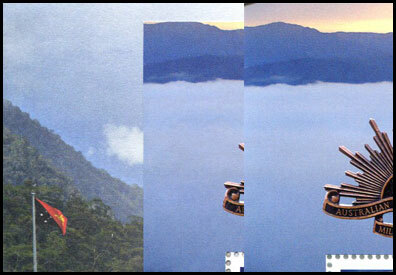 B100 is needed for booklets as the reverse of the backing paper is suitable for printing booklet 'covers'.